You may ask yourself "What is this strange round thing wrapped in newspaper?". The answer is very simple: it's fruit cake! I actually baked this cake [ actually, I baked more than one! ] two weeks ago exactly. I promised myself that I wouldn't unwrap it until Christmas Eve, so I decided to take a picture of it while it's hidden under layers of foil and newspaper. I won't deny it: fruit cake is one of my favorite holiday treats. I have never been able to understand why so many people hate fruit cake. Maybe it's because I have never eaten store bought fruit cake. My grandmother is a great cook and an awesome baker, and I always ate the fruit cake she prepared when we went to her house on December 25. Lately, it seems like fruit cake became more popular, but people change the original recipes so much: they make low-fat versions, sugar free versions, no-bake versions, and most of all they replace glaceed fruits by wholesome dried fruits. Guess what: I am totally against that! I know how unhealthy and full of chemicals those little sugar gems are, but I think a Christmas fruit cake wouldn't be a Christmas fruit cake without them. Of course, the key to make a good fruit cake is to wrap it in cheesecloth soaked in rhum or brandy, then wrap it in foil and newspaper and let it age at least 3 weeks before eating it. Personally, I prefer white fruit cake batter. The fruit cake should still be moist and the fruits should taste slightly like alcohol. Eating the fruit cake right after baking it is okay, but it's a bad idea in my opinion. Here is the recipe for the fruitcake I've been making every year since I was 16 years old. It comes from an old book from the 1960's that my mom had, and I have modified it slightly. Heat the oven at 325 degrees F. Grease a 10 inch crown mold and line it twice with greased wax or parchment paper. In a bowl, mix together all of the fruit, the orange zest, and the almonds. Sift the flour, the baking powder, the salt, the cinnamon and the nutmeg over the fruits. Mix everything gently until the fruits are well coated with flour. Cream the butter and sugar. Add the eggs, one at a time, and beat well after adding each of them. Add the brandy and mix well. Little by little, with a spatula, add the flour and fruit mixture to the dough and mix well. Pour the dough in the mold, using the spatula to make sure that the dough is equal. Bake 2 hours, or until a toothpick inserted inside the cake comes out clean. Do not unmold the cake just now. Put the cake still inside the mold on a rack, and let it cool for at least 15 minutes. Unmold the cake and let it cool down for at least one hour, or until it isn't warm at all anymore. Wrap the cake in cheesecloth, and using a pastry brush, brush the cake with brandy. 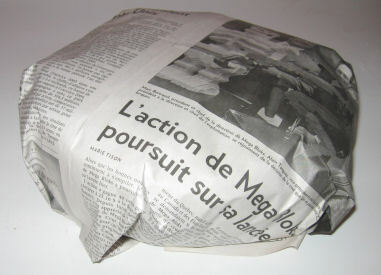 Wrap twice in foil and once in newspaper and store in a cool, dry place. Every year, one month and a half before the holidays, I bake two of those cakes. This year was different, because since I have the bad habit of always buying too much ingredients, I decided to make two cakes AND use the leftover fruits to try another fruit cake recipe. The recipe I tried was.. very strange. It contained an insane amount of sugar, molasses, too many spices and .. no eggs? I baked it in three loaf pans and even though I greased the pans very well and floured them, the batter stuck and one of the cakes was completely ruined. The second cake was only.. um.. half-ruined, and the third one was okay. I have to say that I tasted this cake before wrapping them and I hated it. Maybe this is the type of fruit cake that everyone hates so much! My grandma and my mom tasted this cake and they loved it. They compared it to a confection. But I really couldn't understand. I'm not going to post the recipe here, obviously..
posted by Clara at 9:24 a.m.
Moi aussi, je préfère mon gâteau aux fruits. Si tu n'as jamais mangé ceux qu'on vend, tu as de la chance.